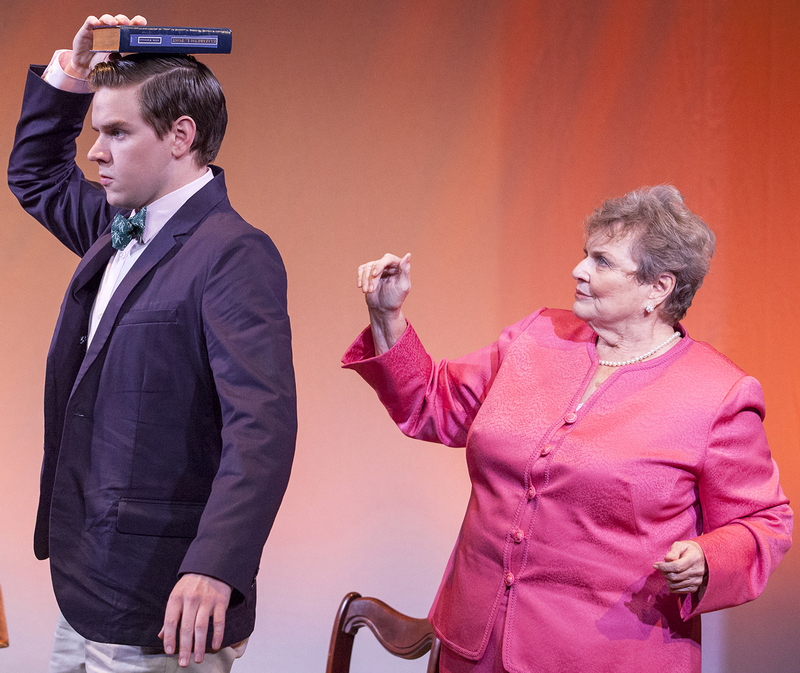 Playwright Jeffrey Hatcher was so influenced by his 10-year old brush with a Manner’s Class that years later he decided to develop his experiences into a play and name the principal character after himself. How much did he embellish his memory of the sometimes traumatic, sometimes hilarious situations? Probably not much since etiquette and respect were still in fashion in the ’60’s and the “Mrs. Mannerly” of the title is pretty typical of the no-nonsense approach to grooming young men and women. But, as this Max & Louie production points out, a few unexpected twists and turns in the remembered reality make for an unique outcome. First and foremost, our etiquette lady has a bit of a shady background and our young master Hatcher is determined to dig into that past. Secondly, Jeffrey himself is no saint and wise beyond his years. Their clash becomes an odd mixture of mistrust and mutual respect. Donna Weinsting is the perfect choice for Mrs. Mannerly. Her brusque approach to teaching social graces gives way to other means while controlling the odd mix of students she has in her class in 1967 Steubenville, Ohio. She soon learns that Jeffrey is out for himself and determined to eliminate what he feels is the competition, taking the “winner take all” approach. Weinsting’s coy manner, occasionally addressing the audience and, in particular, her tipsy scene after nine Johnny Walker Blacks show her wide comedic range. Charlie Ingram, a senior at Webster University, does yeoman work as our ten-year old student, Jeffrey as an adult talking to the audience as well as the other five students in the class. He is convincing as them all including several split-second changes of character without losing a step. He manages to pull the real person (and her not-so sordid past) out of the Mrs. Mannerly persona and by play’s end, they are waltzing off together having formed a unique bond of friendship. Director David Hemsley Caldwell draws deep to make these characters likable despite their often devious ways. The simple but effective Christopher M. Waller set depicts the 2nd floor YMCA rumpus room perfectly where Mrs. Mannerly is forced to pack up her “props” every day and schlep them home only to carry them back to her next class. Sara Wiegard’s costumes are good representations of the period and Maureen Berry’s lights and the sound design of Amanda Werre add to the magic of the long one-act. Speaking of long- the play seemed to drag at times but every time it had a bit of a “valley,” one of those pithy lines of Mrs. Mannerly or schemes of Jeffrey brought you right back into it. Unfortunately, both actors had a few line problems on opening night too, which proved to be a bit of a distraction. But the fun and surprises in “Mrs. Mannerly” are quite obvious and the audience will have a blast with these two unusual personalities (or in Charlie Ingram’s case- seven unusual personalities). 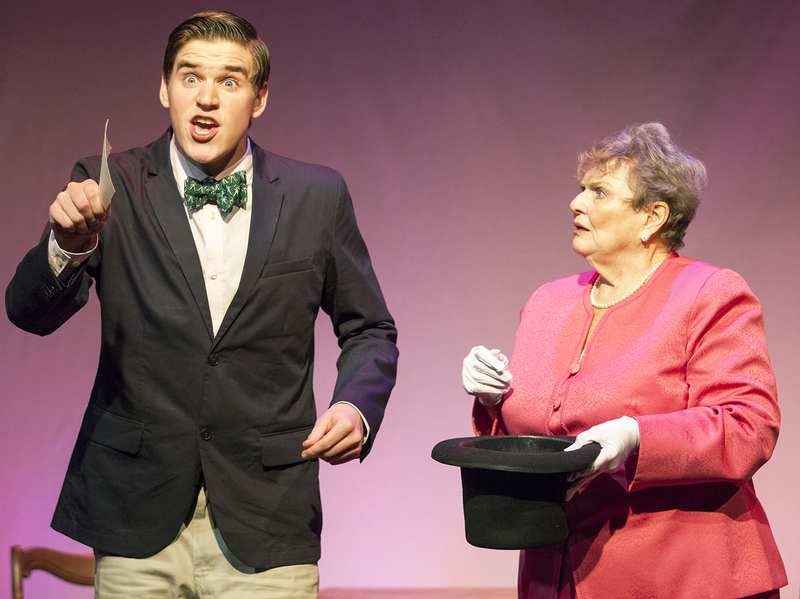 Join the fun at Max & Louie’s production of “Mrs. Mannerly” running through June 2nd at COCA in University City. Give them a call at 314-725-6555, ext. 130 for tickets to this charming look back at manners and civility gone slightly askew. This entry was posted on May 25, 2013 at 9:43 pm05 and is filed under Uncategorized. You can follow any responses to this entry through the RSS 2.0 feed. You can leave a response, or trackback from your own site.